Ranunculus ficaria is a perennial plant and spring ephemeral (lasting for a very short time) that spends much of the year underground as thickened tubers. In the North American region, native ephemeral wildflowers grow and flower early in the spring before leaf-out of the forest canopy. Ranunculus ficaria uses this same strategy, but starts growing earlier in the season and is far more aggressive in its use of space. It out-competes native plants through its extremely early seasonal growth and forms extensive carpets in natural areas, crowding out native plants. Management primarily consists of delicate chemical treatments that must occur before native species emerge. Care must also be taken not to cause harm to flora that is emergent during chemical treatments. 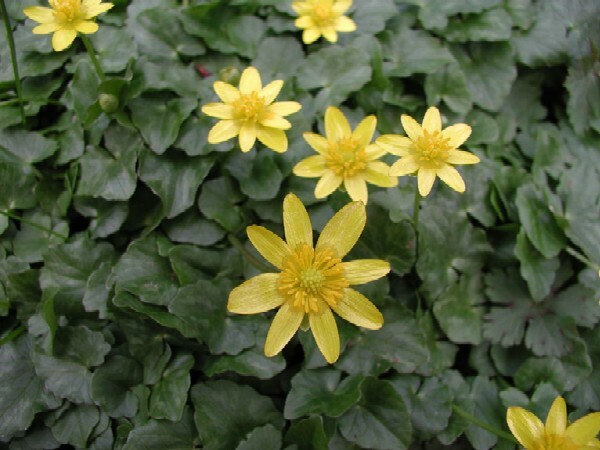 R. ficaria commonly known as lesser celandine is a low-growing perennial herb with shiny, somewhat lustrous dark green leaves that form a rosette. Leaves are kidney to heart shaped with smooth to coarse toothed edges. Each rosette forms a single bright yellow flower that is up to 2.5cms (one inch) wide. Seeds ripen early and the entire plant dies back by early summer, but not before it has developed numerous tubers in which it has stored energy for early growth the next year. Large colonies of R. ficaria can cover acres of forest floor. 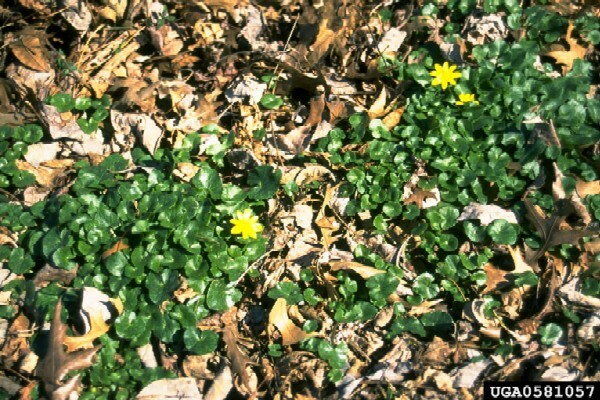 They are easy to spot in the spring because of the high density of bright yellow flowers on the bright green carpet of leaves (The University of Maine Cooperative Extension, 2004). IPANE (2001) states that, \"R. ficaria measures 10-30cm long. The leaves measure 1.8-3.7cm long and 2-4cm wide. The flowers of R. ficaria measure 1-2cm across. The head of the achene is globose in shape and measure about 1.25cm across.\"
R. ficaria is a pernnial plant and a spring ephemeral. For much of the year- summer through early winter R. ficaria remains underground thickened, fingerlike tubers or underground stems. Leaves emerge during winter and the plant prepares for flowering which usually occurs from late winter through mid-spring, depending on conditions. The above ground portions die back after this (Swearingen 2004). The Plants for a Future Database (UNDATED) reports that R. ficaria spring leaves make an excellent salad. The leaves, stalks and buds can be used like spinach. Unfortunately, The leaves turn poisonous as the fruit matures, and caution is advised regarding the use of this plant in any food recipes. The authors also report that the plant can be used as an astringent and claim that R. ficaria has been used for thousands of years in the treatment of hemorrhoids and ulcers. It is not recommended for internal use because of its toxicity. The flower petals can also be used as a tooth cleaner. Swearingen (2004) states that, \"R. ficaria occurs in moist forested floodplains and in some drier upland areas, and seems to prefer sandy soils.\"
R. ficaria's primary method of propagation is through bulbets and underground tubers. The tiny cream-coloured bulblets which are attached to leafstalks are easily dislodged. A mass of small, gray, fingerlike tuberous roots underlies each plant. These bulbets and tubers are easily scattered by animals active around the plant and by water downstream when flood events occur (The Invasive Plants of the Eastern United States Database, 2002). University of Maine Cooperative Extension, 2004. Lesser Celandine. Recommended citation: Global Invasive Species Database (2019) Species profile: Ranunculus ficaria. Downloaded from http://www.iucngisd.org/gisd/species.php?sc=844 on 22-04-2019. The University of Maine Cooperative Extension (2004) states that, \"R. ficaria is primarily a threat to native plants and native plant diversity in lowland woods and on flood plains. It out competes native plants through its extremely early seasonal growth and the development of a dense network of roots and tubers in the soil. Over time it forms extensive carpets in natural areas, crowding out native plants, especially native ephemeral (short-lived) wildflowers. The survival strategy of native ephemeral wildflowers is to grow and flower early in the spring before leaf-out of the forest canopy. By doing so, these plants receive needed sunlight and can take advantage of nutrients released from decaying material over the winter. R. ficaria uses the same strategy, but starts growing earlier in the season and is far more aggressive in its use of space. Unfortunately, R. ficaria is still available commercially for garden plantings.\"
Chemical: Swearingen (2004) states that, \"R. ficaria is very difficult to control but it can be managed with persistence over time using methods that are site appropriate. While manual methods are possible for some small infestations, the use of systemic herbicide kills the entire plant tip to root and minimizes soil disturbance. The window of opportunity for controlling R. ficaria is very short, due to its life cycle. In order to have the greatest negative impact to R. ficaria and the least impact to desirable native wildflower species, herbicide should be applied in late winter-early spring. Apply glyphosate isopropylamine salt mixed with water and a non-ionic surfactant to foliage, avoiding application to anything but the R. ficaria. To minimize impacts to sensitive-skinned frogs and salamanders, some experts recommend applying herbicide in March and then switching to manual methods. Mechanical: For small infestations, R. ficaria may be pulled up by hand or dug up using a hand trowel or shovel. It is very important to remove all bulblets and tubers.\" The authors caution that mechanical control is considered inappropriate for large infestations in high quality natural areas because of disturbance to soil. Informations on Ranunculus ficaria has been recorded for the following locations. Click on the name for additional informations. 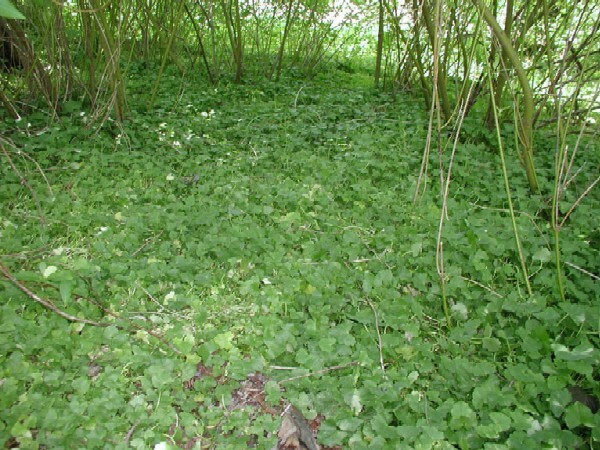 Invasive Plants of the Eastern United States. 2002. Lesser Celandine - Ranunculus ficaria. Plant Invaders of Mid-Atlantic Natural Areas: National Park Service and U.S. Fish & Wildlife Service. IPANE (Invasive Plant Atlas of New England). 2001. Ranunculus ficaria (Fig buttercup, lesser celandine). Department of Ecology and Evolutionary Biology, University of Connecticut [Online Database]. Plants for a Future Database. UNDATED. Ranunculus ficaria. Plants for a Future: A Resource Center for Edible and Other Useful Plants. Swearingen, J. 2004. Lesser Celandine - Ranunculus ficaria. Plant Conservation Alliance, Alien Plant Working Group. Information on description, economic importance, distribution, habitat, history, growth, and impacts and management of species. University of Maine Cooperative Extension. 2004. Lesser Celandine. Maine Invasive Plants. Maine Natural Areas Program & University of Maine Cooperative Extension: Bulletin #2534. USDA-GRIN (Germplasm Resources Information Network). 2003. Ranunculus ficaria. National Genetic Resources Program [Online Database] National Germplasm Resources Laboratory, Beltsville, Maryland. Summary: Information on common names, synonyms, and the distributional range of species. USDA-NRCS (Natural Resource Conservation Service). 2003. Ranunculus ficaria. The PLANTS Database Version 3.5 [Online Database] National Plant Data Center, Baton Rouge, LA.